Arrive Thursday. Fly into Albany, NY and we'll pick you up around 5 pm. We will be sharing side-by-side farmhouses in a small southern Vermont town in the Green Mountains near Manchester and Bennington, about 4 hours from NYC if you want to drive. There will be a light supper and a start on crafting. Friday and Saturday: Coffee and breakfast on the porch or in the great room, then late in the morning, we'll head to town for lunch and touring, shopping, farmer's market, or whatever we've discovered that's local and can't-miss. It's high season for flea markets, tag sales, town festivals. Back home for dinner and crafting. Three nights and days of lodging, food and drink at the house, crafts and pick-ups at the airport (within a specified window of time Thursday and Sunday) as well as our excursions out and about. And there's gift bag swag! I'll teach some stitching and felt applique. There will be other crafts too. We'll be wearing comfy clothes for all kinds of weather and adventures. Bring your slippers. We'll be eating simple but delicious, home-cooked food that takes advantage of seasonal harvests. And we'll be finding great antiques, junk and treasures. It's a fabulous place to gather with friends, old and new, and we're going to have a great time! If you'd like to come or have questions, email us at fallvermontgetaway[at]gmail.com to get on the list. Thanks! EDIT: This event is sold out, but if you think you might like to attend the next one, please email us to get on the list. Thanks! This weekend we've been celebrating Erin's graduation from the MFA fiction program at Sarah Lawrence College. She has her degree, a delightful group of colleagues and an impressive body of work to carry forward. We are so proud of her and overjoyed by her happiness. It's been a richly layered weekend, full of emotion. Listening to her deliver her thesis reading the evening before, I thought I would float away. And there was still more. Maggie and James hosted a celebration in her honor. A tent and decorations, spectacular food, a special cocktail.The firepit's inaugural fire, warming a cold and blustery spring day to evening. But in between, here and there, I've been tinkering with the plans for our Vermont getaway. Details and registration info to come on Tuesday, after the holiday. Hope to see you here then. If you want to be reminded or be on the mailing list, email us at fallvermontgetaway[at]gmail.com. Here are a few of the many photo collages I've been making. It's lovely there! This is my favorite photo from our trip last fall to Meleen's southern Vermont house. It captures everything that I loved best about it - drinking coffee on the porch in our pajamas, talking, planning the afternoon adventure, new friends, great laughs. And Meleen, the most amazing, energetic host to our fabulous weekend. She and I are teaming up to host a weekend this coming October 3-6. Peak season for autumn leaves, antiquing, farmer's marketing, tag sailing and crafting (and all the in-between good times of a small gathering in side-by-side houses). There will be more news to come. Time to let you know so you can start thinking about it. Nothing like New England in the fall. We're pretty excited! It's going to be so much fun! 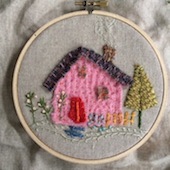 I'm stitching a new piece with the thread sent by Cosmo and Lecien. After all these years of loving pearl cotton, I'm a convert and do think it's so, so wonderful to work with. The rain just stopped for a bit. Let's go outside and see the spring flowers while they last.